The Cobalt Spot Test detects free cobalt down to a limit of 8.3 ppm (parts/million). The sensitivity threshold of most cobalt allergic patients is above 10 ppm. 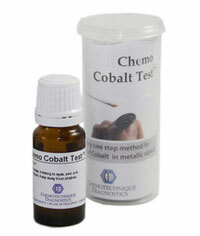 Chemo Cobalt Test™ contains Nitroso R salt solution. Used on cobalt containing objects, the solution will turn bright, redish-pink .